This garage studio is a replacement for an aging single car structure. The new space was designed as a working creative environment. 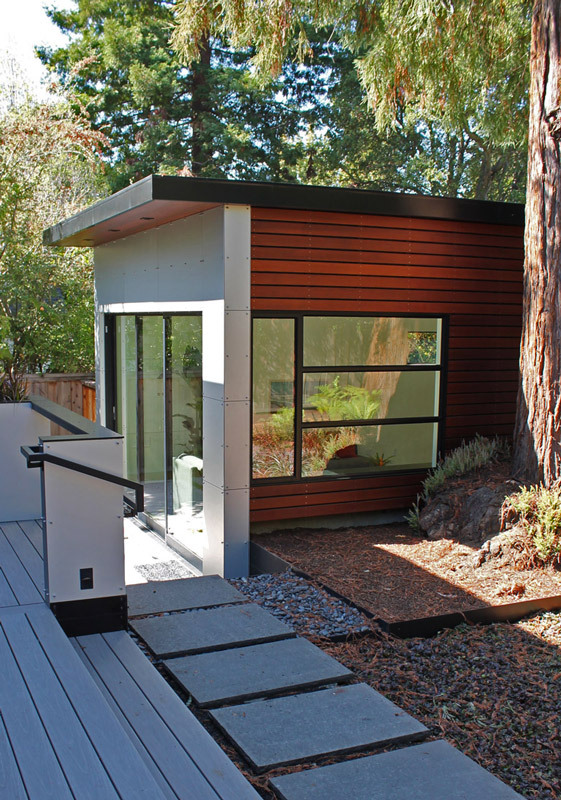 Designed to house a home office, the bright space opens to views of the yard. The large sliding doors at the front open to accommodate a car for planning requirements. This broad opening also allows open access to the front court. The connection between interior and exterior allows a small space to become larger. A large redwood tree required a mostly above ground foundation wall / grade beam with drilled piers to isolate any connection to the root system. The strong awareness of nature is enhanced by the tree and large windows open to its presence. The conditioned studio space is attained by radiant heating slab. Sustainable design elements include high fly ash concrete, ultra high efficiency hot water heater, non-voc paint, recyclable anodized aluminum facade panels, cedar rain screen borders the eastern garden and concrete panels on the property line exterior walls. A pervious gravel driveway and moss bordered concrete pad fore court complete the exterior sustainable elements..